If you’re looking for top quality, value-for-money wooden trophies for your sporting events, end of season awards nights, or presentation evenings, then Aford Awards can help you. We’ve been supplying wooden shields to sports clubs, schools, festivals and tournament organisers for over 30 years and have firmly established a reputation as one of the leading trophy suppliers and engravers in the UK. We always monitor our prices to ensure you get the best possible deal. So browse our fantastic range of quality wood shields here. Aford Awards specialise in all styles of sporting medals and our presentation shields are no exception. We offer a wide variety of  shields for any type of event. Whether you’re a rugby club, athletics club or tennis club (or any other sports club for that matter) then look no further! Why not include your own personalised club badge or tournament logo as an additional option if required. Wooden shields are a traditional and popular way to record the winners of your most prestigious events. If you need any help with these please give us a call on 01622 738711, to speak to one of our friendly advisors. 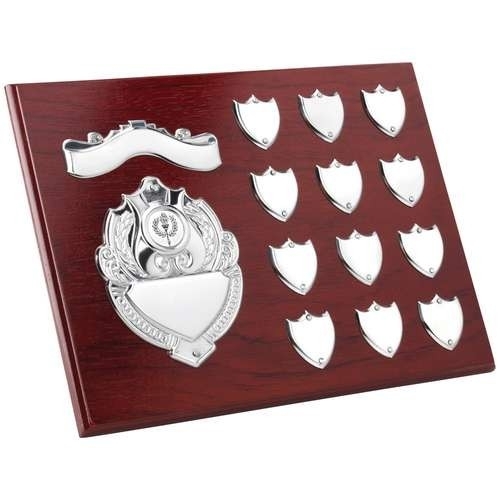 Aford Awards offer the best priced wooden trophies and shields online and offline. Each one is made from the very best materials, ensuring they look great in your display cabinet for many years to come. We aim to give you the best prices you can find online. In fact, if you can show us an identical trophy that is available at a cheaper price anywhere else, we’ll beat that price by 5%. To find out more on about our price guarantee - please read our price promise page. If you are looking for that little extra touch to your wooden shield then you can personalise it with free engraving. Our innovative engraving equipment can also customise an endless array of items, such as watches, jewellery, lighters and tableware, as well as trophies you have purchased elsewhere. If you need a different item engraved then take a look at our premium engraving service. If you cant find a wood shield that you like or If you have any questions about our products or services, please feel free to get in touch – any one of our team will be happy to help. Alternatively, if you’re looking for trophies or medals for another sport, check out our sports trophies page where you'll find everything from football trophies to swimming trophies.